Want to win a 5 pack class pass to be used at any participating Fit4Mom location (Greater Denver, North Metro Denver, and Northern Colorado franchises)? Head to Facebook to enter! Giveaway ends 5/12! Fit4Mom is an organization near and dear to my heart! I have never been athletic or much into working out but in 2010, when we lived in Maryland I heard about a Couch to 5K at our local running store and I signed up. Something in me changed! 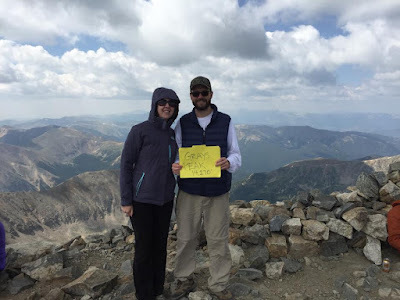 I set goals and beat them! I loved socializing with the other participants and successfully ran my 1st 5K race that summer. The next fall I signed up for their 10K training and ran my 1st 10K race and just kept on running! In 2011 when I got pregnant with our 4th child, I knew I didn't want to lose this fitness I had built up. 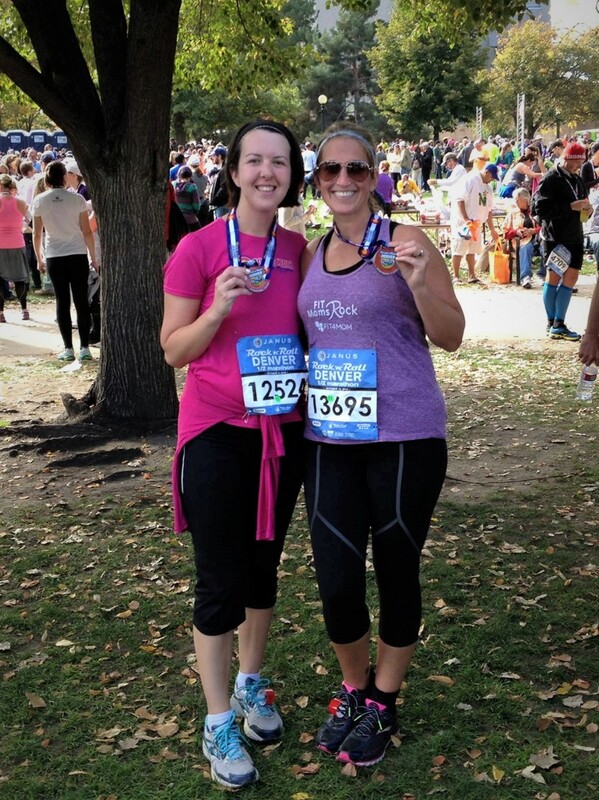 I was determined to run as far along in my pregnancy as I could manage. I ran until about 24 weeks when a cold snap hit Colorado and I was starting to really show. The problem with stopping running is it is hard to get back into it! 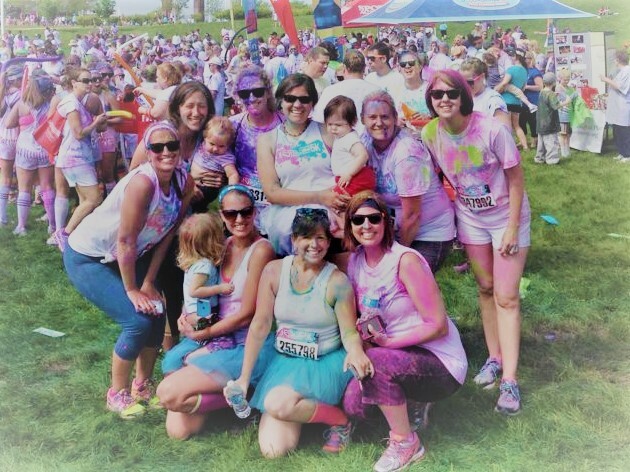 During our 2011 move from Maryland to Colorado and my subsequent pregnancy, I never did find a training group that was my speed. Then came a baby who never slept and was very high needs and running and exercising did not happen for this mama! Two of my friends, who didn't know each other both opened Fit4Mom franchises in the area. I checked out their openings but I wasn't sure it was my thing. One of the owners, Darcy Peters, persistently encouraged me to sign up for the Fit4Mom marathon and half marathon training. If she didn't persist I would have never said, "yes"! A marathon seemed beyond my reach but with some time, a lot of hard work, and some encouragement, maybe, just maybe I could run a half marathon. That was December 2013 and I am currently training for my 4th half marathon! Running is my outlet. It keeps my mind clear when my world is chaos. It keeps me exercising. It keeps me connecting with other moms. It keeps me setting goals and working towards them. It keeps me doing something for me and me alone. Fit4Mom was the group I needed. It was structure, it was accountability it was experienced coaches, it was friendship, and it was encouragement. I would have never crossed those finish lines without those ladies who logged all those miles along side with me. We have laughed and shared way too many TMI moments. There is something about running together, where you just bond. Running friends are the best friends! 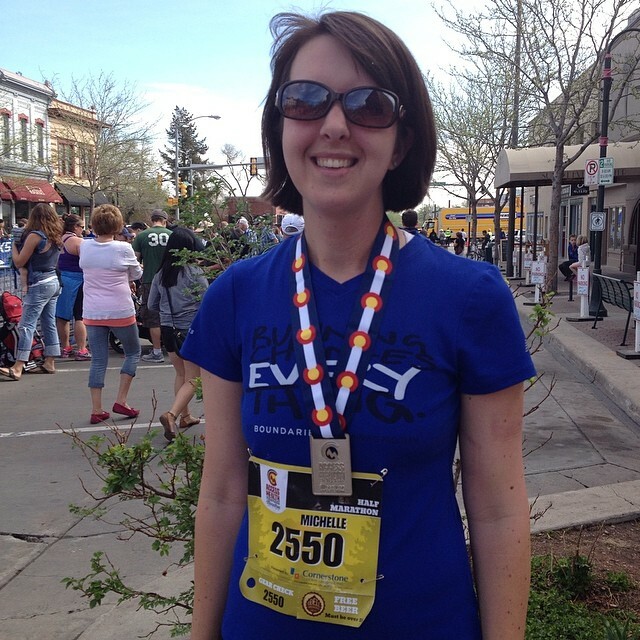 In May, 2014 I successfully completed my 1st half marathon, the Colorado half marathon. I started my race with all my teammates but one teammate stayed with me the entire race. She likely could have finished several minutes ahead of me but she never left my side. We finished together and it was an awesome feeling to have accomplished something that many people will never come close to! I took a short break from training but started back in July to train for the Denver Rock n Roll half marathon in October. Fit4Mom was there again, along with my awesome teammates and friends. Training for a half marathon, you log a fair amount of miles over about 4 months. Not only did these ladies faithfully show up each week for our long runs, we often met up once or twice during the week to get in our shorter, midweek training runs. The Denver Rock n Roll half I was on pace with a great friend of mine, LeAnn. When she struggled, I encouraged her along, when I struggled she encouraged me. I beat my 1st half marathon time by several minutes and came in about 2 minutes under my goal. I was a happy runner! 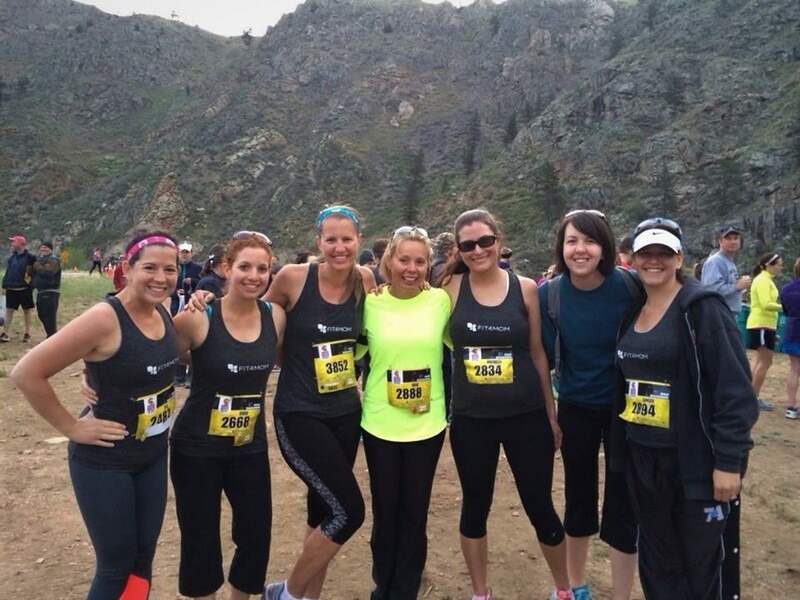 Fit4Mom Northern Colorado Denver Rock n Roll Team! LeAnn and I proudly holding those medals we earned! After almost 10 months of training I was getting mentally fatigued and needed a break. A lot of my team mates went on to train for the 2015 Colorado Half Marathon but I needed a break. Darcy Peters, the Northern Colorado Fit4Mom franchise owner encouraged me to try a BodyBack class. I was hesitant to say the least. I had come to love running but don't love exercising otherwise. I had never dieted but becoming healthier and losing weight was appealing. Plus I loved these ladies and two set dates each week to see my mom friends sounded like a bonus! From the end of 2014, all of 2015, and the beginning of 2016 I took 3 sessions of BodyBack and I came to love the HITT style workouts. The diet part was hard for me but I saw results! My family loved the dinner recipes and some are still in our regular rotation. It was awesome to do assessments at the beginning of BodyBack and measure how fast you could run a mile, how long you could hold a plank, etc. and then at the end of the session seeing how much you had improved. Then there is the before and after photos and inches and pounds lost. I always saw great results and it was awesome to do it in a supported, fun atmosphere, with women who had become my friends. Then these crazy friends of mine, talked me into a race I thought I'd never do. 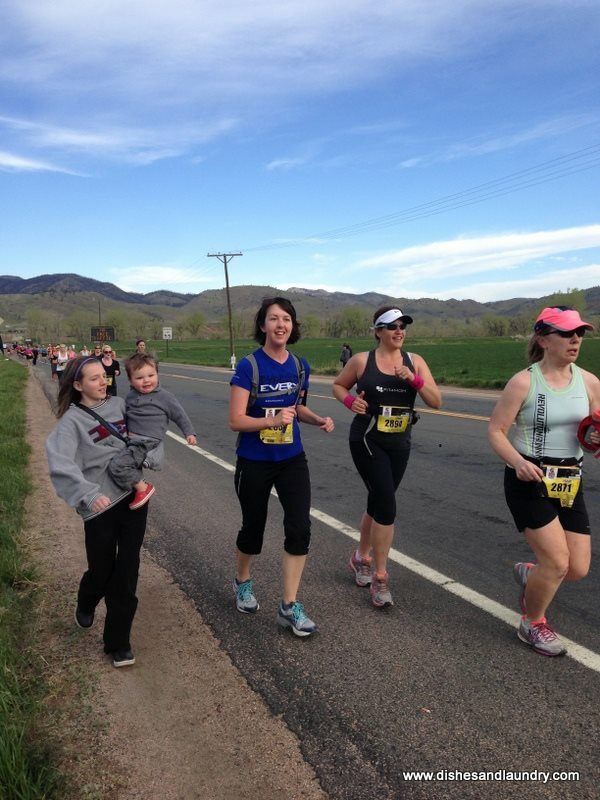 Horsetooth Half Marathon. Those of you not from Fort Collins may not realize but this is a tough, tough race! You run up a mountain, partially down, then back up another mountain. I am social person and once several of my friends who I had made through Fit4Mom committed to Horsetooth Half I signed up. The training was great. Yes, lots of cold days in January and February but we were ready to race. The day of the race it was snowing like crazy, blowing sideways, not the type of weather you want for a big race you've been preparing for 3.5 months for. With my Fit4Mom teammates and friends, Joni and Dara by my side, the 3 of us crossed the finish line of the Horsetooth Half Marathon. I am still so proud that despite that weather, all 3 of us finished! 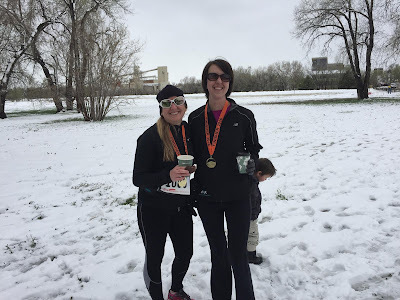 It wasn't our fastest half marathon but we ran a half marathon, up a mountain, in a snow storm. There was nothing we couldn't accomplish! Fit4Mom isn't just running training or BodyBack, it is friendship and support, and healthy lifestyles and healthy families. Their flagship class, Stroller Strides allows you to workout while you bring your baby in the stroller with you. They also offer Fit4Baby, pregnancy fitness and StrollerBarre, classes for moms with baby. I have so many great memories with these ladies. Not only of running and exercising together but of ladies night out and fun times together. 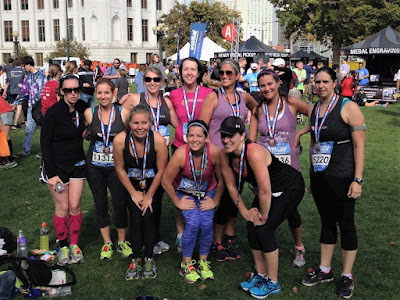 Being part of the Fit4Mom family the past 3 years changed me and my approach to fitness. It has grown my love of running and it has shown me that I can dream big and accomplish those dreams. There is nothing I cannot do if I put my mind to it and work hard towards my goals. Want to learn more about upcoming Fit4Mom events? All opinions are my own and based on my own experience participating in Fit4Mom programs. I was compensated for my time to prepare this post and share it via social media.